David's unique approach to oil painting enables him to capture the mood and atmosphere of his subjects. Working in his native Yorkshire, he paints Staithes harbour with boats moored in the river, a colourful beach scene and an autumnal view of bridge and stream painted 'contre jour' . 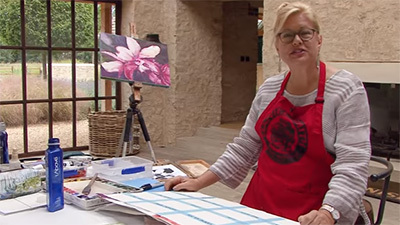 In many people's minds oil paint is regarded as a somewhat heavy and solid medium and they look to watercolour for lighter and more ethereal effects. A recent video, entitled A Light Touch demonstrates effectively that this need not be so. The artist concerned is David Curtis, a member of the Royal Society of Painters in Oils, of the Royal Society of Marine Artists and winner of the Singer & Friedlander 1992 Watercolour Competition. He is a firm believer in working on site, to observe and capture at first hand the transient colours and moods of nature. This means working quickly and spontaneously, simplifying form, ignoring irrelevant detail and going all out for feeling and atmosphere. With his understanding of tone and colour as well as a strong feeling for composition, David Curtis is well qualified to demonstrate this approach. He uses a variety of supports - canvases, canvas boards and hardboard which he prepares himself. This he does by sandpapering the smooth side, applying a coat of gesso primer, another of gesso primer and gesso paste, to produce surface texture, and a final coat of acrylic primer to restore the white surface. He then applies a suitable base colour, heavily diluted with turpentine; this colour naturally, depending on the nature of his subject. He uses no linseed oil, but occasionally thins his paint with turpentine. 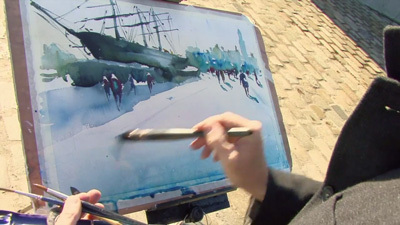 His limited palette consists of titanium white, Naples yellow, Winsor lemon, Indian yellow, cadmium orange and red, cobalt, French ultramarine, cobalt violet, burnt sienna, viridian and cerulean. His first subject is the much painted Yorkshire fishing village of Staithes and here he chooses a vantage point from which he can look down on the river as it winds its way into the harbour. He sketches in the main lines of the river, the clustering houses and a few of the many boats, on his prepared board, using a small brush and a neutral mix of paint and aims for an overall impression rather than precision. He develops his painting by working over the whole board rather than by concentrating on one particular area, and looks for tonal contrast wherever it is to be found. He finally 'tidies up' by adding a few darker accents for windows and the like, but does not carry this process too far and the finished painting retains a delightfully loose quality. His next subject is a colourful beach scene at Sandend, just down the coast from Staithes. For this he uses a canvas board to which he applies a graduated light base wash of blue merging into ochre for the sky, and this is later developed to produce a loose but effective impression of high level cumulus cloud. The beach is put in thinly and simply to enable him to superimpose the figures without long delay. 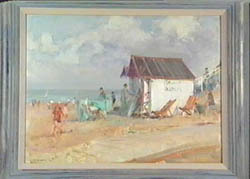 The figures and deck chairs add useful touches of bright colour. The final subject is the Dales village of Linton in the autumn and here the artist selects a spot on the bank of a small river, looking into the light of a hazy sun. He begins by putting in the pale, warm tones of some backlit leaves and the intense light on the water and follows this with the dark accents of the silhouetted tree trunks, thus establishing at an early stage the tonal range of the subject. 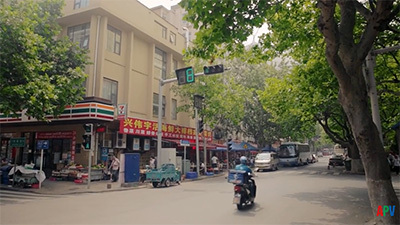 He constantly looks for colour variation in the trees, the buildings and the other elements in the composition to add interest and artistic appeal. Once again he concentrates on atmosphere rather than detail and offers the excellent advice of "paint what you see, not what you think you see". 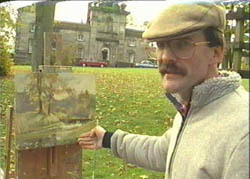 The video ends with shots of the three demonstration paintings suitably framed and other examples of the artist's splendid work. This is a professionally made video which shows a talented artist at work. Sincerity is what comes through from David Curtis. He is no media man but is magnanimous in revealing the details of his working methods. The film continues the APV tradition of showing not how it should be done, but how the artist does it. He is an accomplished colourist and competent draughtsman; equal to landscape and figure as he is to the mutating light of the British climate. 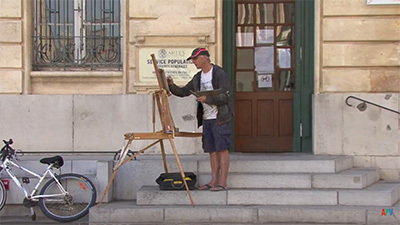 We are led from the intimacy of his studio into the challenge of 'plein air'. From the priming of his boards and canvases to explanation of his equipment and working methods outdoors, he reveals his own devices for easing the painting process. He 'squints' at the subject to cut out extraneous detail. He "doesn't clean his palette much", that's how small subtleties of colour come about. He talks of those "little areas of mystery" where simplification works better than officious striving. Detail, for instance, on his Whitby 'cobels' (a type of local fishing boat) about which, in his view of Staithes, it is wise "not to say too much otherwise they are not part of the whole." He lays out his palette clearly for our inspection, describing his colour mixes as 'he paints. He performs a tour de force rendition of a beach scene. 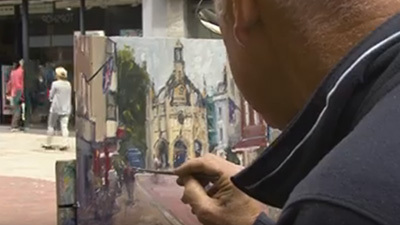 Here he scrubs back to white canvas to produce high tones, having previously covered the canvas with a colour wash. His palette is interesting; his yellow range includes Naples yellow, transparent yellow ochre, Indian and Windsor yellow. His concluding essay is a back-lit scene of river cottages and trees with impasto light "cutting into the foliage" and "lost and found" brushwork for branches and houses. In his own words he avoids "the tendency at a late stage of the picture to tighten up." 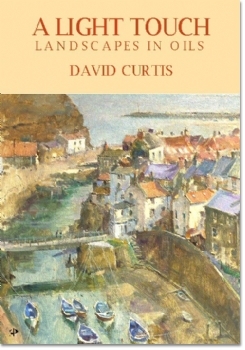 Many of us, I guess, would like to compose, draw, and paint with the competence of David Curtis. To render the atmosphere and mood of a pleasant place in sumptuous colour and brushwork. To reach such a level of response takes time and practice. APV have enabled us, once again, to stand at the artist's elbow and experience his working methods. The video will make a valuable addition to art club libraries. 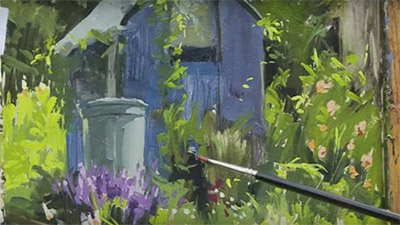 For those who would like to capture similar effects in oils we stay in Yorkshire for the splendid new video by David Curtis, A Light Touch: Landscape in Oils (APV Films). Here is another enthusiast for working on site, no matter what kind of weather! As well as the fine locations and clear demonstrations there is plenty of sound advice, technical hints, and ideas. 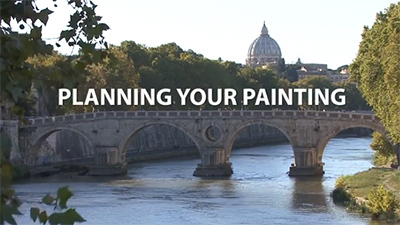 Great tips on all aspects of plein air painting given by a true master. Clear, concise and well filmed. I bougth the 4 DVDs in NTSC in USA.I really like the style of David.I am learning a lot.Also bougth the wonderfull book Painting withIm Impact in england.I'm from Brasil!